We have a Kids singer on Oz called Don Spencer, and he has an appropriate druid theme song called Feather, Fur or Fins ( especially now I have flight form. Feathers ! Yeah!) The song is from the 80’s when I was growing up ( showing my age here) ( not to be confused to with Feather, Fur and Fins) – I cannot find you a Youtube clip of Don’s song however if you really want to listen on his website you can listen to an extract of the song – so I got to practice the tune 🙂 I guess the need to identify with trees now are a little less so I still think the song fits even though there is no bark in there. I think I am kind of in love with my Druid. She is well on her way to being my 6th 80 – and is 63 at the moment. I thank Elune for catform and Dash so I can run faster to catch up to you when you don’t give me enough time to drink. I thank Elune for Innervate so I don’t have to do that often. I should set up a macro every time I get meleed for something higher then say 20% if my health. ” Save your healer” “Get them off me” “Halp!” I do try and do all my best to keep myself alive. Barkskin, Shadow Meld, Natures Grasp – then a shuffle out of the mobs melee range. I haven’t got all the yummy healing spells yet, but so far I feel I have one for all occasions. 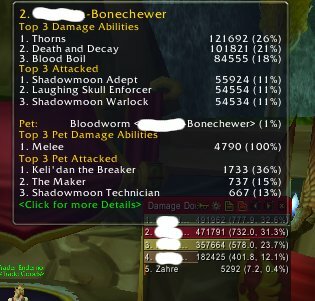 The lots of little heals, Swiftmend, and Wildgrowth are easily able to top off people who when healing as a priest (pre Circle of healing ) required a dedicated flash or renew. I have also been using most of my innervates on myself. Though if its on cool down and I don’t believe I will need it, and someone else does I will cast it on them. I don’t have it macro’d telling them they are getting it, so maybe they don’t even realize. When I was leveling my hunter through dungeons with a friend’s druid he used to give me Innervate. – and I can’t reciprocate to other hunters now because they don’t have mana anymore. If I remember right, glyphed the ability has a 25 second cooldown and lasts 20 seconds. Considering the incredible amount of damage it puts out, I’d say it damn well might be the best major glyph in the game. 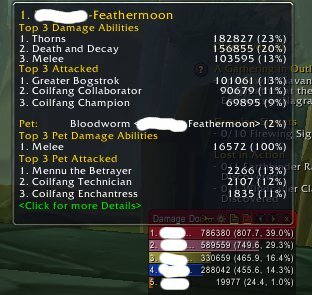 1 GCD and you’re doing more damage than most classes, and helping your tank get threat AND not to mention the “feedback loop” of killing things faster means less chance of you dying. except I don’t get credit for the damage /sob I haven’t glyphed it and probably won’t – I am not sure I want to be expected to use it more often then I am. He spec’d into bloodworms, there are better talents at this point even at that level, that could use the points. Not sure how much experience you have with druid just be careful with pre-hoting. Even with massive AoE threat pre hots can cause you to pickup aggro right quick, especially in tbc content with the wired multi-caster packs and such. And back to the DK tanks, many of them have never been a tank class before. It gets a bit better for them the higher up in levels you get. There seem to be a few talents like Blood Worms that it’s just not worth putting the points into over something lower/higher in the tree. You can cast thorns and then go into bear form though. Judging from Astrylian’s post and Ghostcrawler’s post Blizzard does not seem to mind this and it’s somewhat intended even. At 85, a Bear Druid can generate considerable amount of burst/opening threat between throwing Rejuvenate on herself, planting Mushrooms and casting thorn right before charging in. I haven’t found that it gets much yummier on the healing spells front. Lifebloom just isn’t that useful, it tends to pop when you don’t need it and the mana return from Revitalize isn’t all that exciting. I keep 3 stacks on the tank because you’re sposed to but if Blizz removed it from the game tomorrow I wouldn’t even bother to wave goodbye. I wouldn’t cast Tranquility more than once every 5 dungeons (but it is a wipe saver, I WAS using it frequently down low before 4.0.1 took it away, it had much more utility in 5 mans with inexperienced groups than it does now at nearly 80) and I’ve cast Nourish once, ever, and been dissapointed with the results. Havig said all that, my Druid is my favourite healer atm and is making a strong case to be my main in Cata. An Absolutely Ordinary Druid? Maybe. Yeah.. this 3 stacking lifebloom and keeping it up was annoying the one dungeon I ran with it. It became like keyboard dance. heal Heal bloom stack.. heal heal.. bloom stack. Will it be socially acceptable not to use it unless they really need it.. ? Doubt it at 85. Too much of your mana regen is tied to it. Even at 60+ Dungeons, should probably use it to put up Replenishment. It’s cheap enough for you to just randomly toss it around w/o actually caring though.